VINTAGE FORD ROUGE PLANT and FORD ROTUNDA photo picture print photograph for sale. 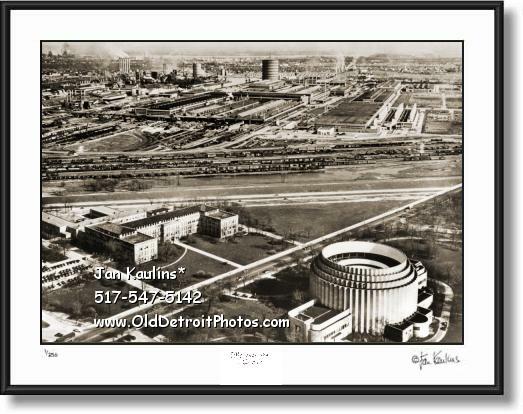 This sepia toned AERIAL OLD FORD ROUGE PLANT COMPLEX FORD ROTUNDA photo print for sale is made from a professionally restored original vintage negative/photo. In the foreground can be seen THE FORD ROTUNDA and in the background of this aerial Ford Rouge Complex photo print for sale, beyond the many rows of trains and tracks, we can see the chimneys and industrial facilities of this Dearborn Ford Rouge Complex, circa 1950's.